Reducing Your Risk of Cancer – 3 things you should include in your diet. Did you know that an estimated 1,529,560 people were diagnosed with cancer in 2010? That’s 4,190 new cases per day! Unfortunately, we have become acutely aware that there are many things in our world that are carcinogenic and inevitably will find more things in the future. Mutagens come from a variety of places including tobacco smoke and environmental pollutants. Popular herbicides contain glyphosphate, a compound that depresses the function of important enzymes that are essential for detoxification. The number one cancer causing mutagen, however, is our diet. For example, the frying, baking, and roasting of carbohydrate rich foods produces acrylamide, which is a known cancer causing agent in animals. Everyday we are surrounded by these mutagens that have the potential to cause a genetic mutation within our own cells resulting in a mistake in our genetic code. According to the New England Journal of Medicine, “Cancer results from the accumulation of mutations in the genes that regulate cellular proliferation.” As these mutations begin to accumulate the cells can no longer regulate their own production and begin to grow out of control. They no longer demonstrate the innate ability of apoptosis. Apoptosis is defined as programmed cellular death. Healthy cells that develop abnormalities are programmed to destroy themselves when mistakes are made. Cancer cells, because of excessive mutations, lose this ability and continue to reproduce despite the fact they are causing damage. The human body has a very unique and effective way of dealing with chemicals that it may come into contact with. This detoxification system has two phases within which it works. They are aptly named Phase I and Phase II. This system is able to detoxify even the most potent of chemicals, including pesticides and other foreign compounds found in the environment. Although these systems are very complex, we will go over them briefly and broadly. The molecules produced in Phase I may be even more toxic than the initial chemicals because the molecular groups that are added to them by the body’s detoxification system are very reactive. This allows these molecules to act as free radicals in the liver. This is not problematic as long as Phase II is working well. The Phase I molecules are usually quickly converted to harmless molecules for excretion in the urine or bile by Phase II. At this point you may be asking, “Why do I need to worry about it if Phase II acts so quickly?” For one, the process is slowed with age and some people metabolize slowly while others metabolize much faster. This shows the need for nutritional supplementation which maximizes the efforts of Phase I and II and reinforces the idea that we should provide the liver with ample amounts of antioxidants. So the question remains. What can you do to help protect yourself from dangerous mutations that may lead to cancer in the future? Many nutrients have been found to be essential cofactors for the detoxification system, but three have recently been found to directly enhance its activity. The first is curcumin. It is a nutrient that is derived from turmeric. Turmeric has been used for centuries throughout India and Asia for a myriad of different maladies ranging from upset stomach to arthritis. It has also been shown to reduce total cholesterol and inhibit LDL oxidation. In a study at India’s Panjab University, researchers found that curcumin inhibited mutagenicity by as much as 80% against mutagens in cooked foods. Curcumin has also been shown not only to be preventative but also helps reduce the progression of cancer. Curcumin appears to act by boosting the activity of glutathione S-transferase which is an important Phase II enzyme. Curcumin has also been shown to be a potent antioxidant. Antioxidants are important because they scavenge free radicals throughout the system. Free radicals act on the body on a cellular level producing damage in whatever they come in contact with. Another potent inhibitor of mutagenicity is chlorophyllin. This is derived from the green pigment in plants called chlorophyll. Chlorophyllin is beneficial because it is water soluble and is easily transported in the blood. It has been shown to inhibit mutations in bacteria when placed in a Petri dish with known mutagens. Although its precise mechanism of action is unknown, it is thought to act as a powerful antioxidant as well. In one study, chlorophyllin was shown to promote apoptosis in human colon cancer cells. This is important because it is thought that the alteration of the process of apoptosis is one mechanism by which cancer continues to reproduce. Chlorophyllin is has also been shown to be heat stable which is important because it will maintain its powerful properties after ingested. A study at Johns Hopkins University showed that broccoli extract significantly reduced incidence, multiplicity, and weight of mammary tumors in rats after exposure to known mutagens. Its activity is thought to work by enhancing enzymatic activity in Phase II of the detoxification system. Cancer levels continue to be very high in the United States. With the never ending influx of new chemicals into our world it is important to protect ourselves with nutrients that have been proven to be beneficial in the prevention of cancer. Curcumin, chlorophyllin and broccoli extract have been shown to be very effective. Traditional medicine promotes early detection as a crucial weapon in defeating cancer. Early detection is of course important, but it is not prevention. We propose that all of our patients take an active role in their health and prevent serious illness through good nutrition. Are we getting enough Vitamin D? The Institute or Medicine (IOM) says we are. They say we might even be getting too much. Their recent report released on November 30th states that most Americans are getting enough vitamin D from their diet and supplementation is unnecessary. In fact their conclusion to the report states “the committee emphasizes that, with a few exceptions, all North Americans are receiving enough calcium and vitamin D.” I couldn’t disagree more. The IOM examined over 1,000 studies and reports to make their conclusions that people need no more than 600IU of vitamin D per day. They concluded that people are getting enough vitamin D. However, this blanket statement only applies to one health factor – bone health. It is my fear that people will see the headlines on the news and assume they are getting enough vitamin D. The headlines inevitably will read “Americans Getting Enough Vitamin D.” They will not tell people this refers only to bone health. Vitamin D does so much more than protect your bones. The IOM says the evidence, at this point, is insufficient to say that vitamin D has a protective benefit in any other area of health. Research, however, has shown it improves cancer rates, reduces the incidence of MS, decreases cardiovascular disease rates and many more. Part of the problem is that the IOM based it’s conclusions on what it takes to maintain bone health and since 2000 the research for vitamin D has exploded. Many studies, published in some of the world’s most respected peer-reviewed journals, have concluded in direct conflict with what the IOM has said. The IOM has said the studies that were done that drew conclusions on vitamin D’s other health benefits were either poorly designed or were insufficient to conclude vitamin D is good for anything but bone health. These studies that they dismissed were good enough to be published in many of the best journals in the world. I guess the IOM does not agree. Below is a graph of the disease reduction rates by serum levels of vitamin D. As serum levels rise, the rates of many diseases are reduced. For example, breast cancer levels are reduced by 30% when vitamin D levels are at 34ng/ml or higher. The X’s represent reasonable extrapolations based on the research but is beyond existing data. Vitamin D reduces the rates of all of these diseases. It is NOT just for bone health as the IOM has concluded. The references are listed above as well. If you look at the graph above you will see that the research is consistent with that statement. At 20 ng/ml of serum vitamin D 99% of cases of rickets is prevented. This is a disease of soft bones in children. But what about all of the other wonderful, researched benefits of vitamin D? The IOM has seemingly missed the boat. 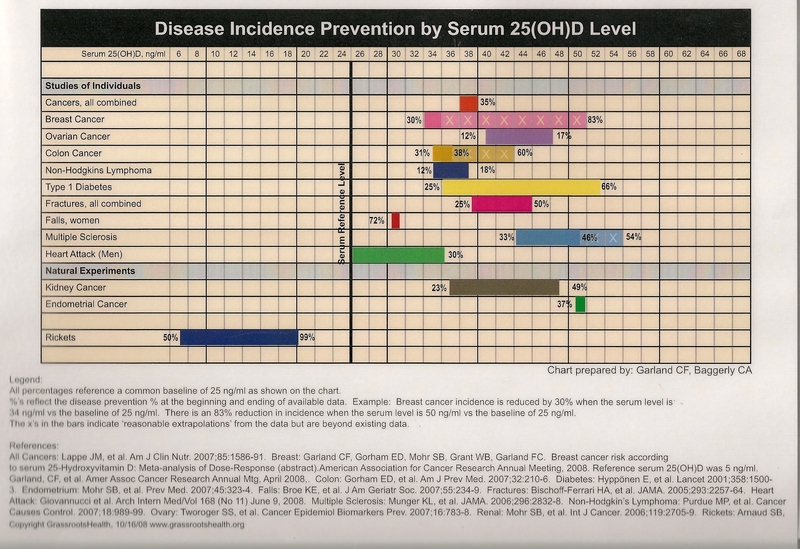 The graph above would suggest that a level of 60 ng/ml is optimal to protect a person from the diseases listed. This is a serum level that cannot be obtained by current diets. A person must supplement to reach this level and the IOM’s recommendation of 600IUs per day obtained from diet is exceptionally low. I recently tested a patient who was under my care and was taking 4,000IUs per day as I had recommended. Her serum vitamin D level came back at 18ng/ml. By any current laboratory’s standard this patient was deficient in vitamin D. And that’s after taking 4,000IUs per day for 2 months! How can the IOM say 600IUs is enough for everyone. It makes absolutely no sense whatsoever. The IOM’s own report concluded that the average intake is below the median requirement but that blood levels were above the 20ng/ml required for healthy bones according to the quote above in gray. How could that be possible? Perhaps the 20ng/ml of serum vitamin D is too low as well. This would make much more sense. Instead of making that conclusion the IOM simply concluded that people must somehow be getting enough vitamin D.
The IOM has taken an exceptionally conservative stance on this. Their stance on this is equivalent to saying that people shouldn’t exercise more than 10 minutes a day because any more than that might lead injury. I recommend my patients get at least 2,000IUs per day of vitamin D. I myself take 8,000IUs per day. The benefits of taking vitamin D far outweigh any perceived “risks” associated with it. Vitamin D is very safe and I hope this report doesn’t persuade any physicians into thinking it’s not. 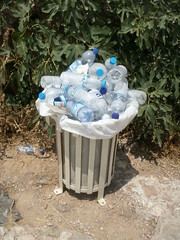 Bisphenol A, or BPA, is a chemical additive that is used in many things but mainly in plastics and linings of food cans. Up until a few years ago this was considered a harmless addition to our already high chemical exposure levels. Then, it was found that exposure to this chemical is linked to serious side effects but you could avoid any consequences by not reusing that Poland Spring bottle, by not overheating your plastics in the microwave or by buying BPA free merchandise. Now we are finding out that our largest exposure to BPA is our food itself. BPA has been linked to breast cancer, heart disease, diabetes, male infertility and other health problems. Recently a U.N. panel concluded that the BPA in the packaging of our foods is actually leaching into the food making our food the number one source of exposure. This should not be surprising. One only needs to see the aftermath of the oil spill in the gulf to see that chemicals can get everywhere given the opportunity. Information is limited on BPA. It certain amounts it poses threats to fetuses, infants and growing children. No one is quite sure what it does to adults. For me, that’s enough. If you didn’t know if a gun was loaded, would you point it at someone and pull the trigger? Hopefully not and this is similar. Just because we don’t know if it’s dangerous and the government is unwilling to take a stand on it just yet, doesn’t mean it shouldn’t be eliminated from our food supply. This is just another reason to eat an unprocessed, natural diet. Because this exposure of BPA is coming from foods that are packaged it can be avoided to some degree. Eat a diet that is high in healthy protein, fats and vegetables and fruits. Stay away from the packaged food as much as possible. Not only will you avoid BPA but you’ll also get all the great benefits of a healthy diet! The Next Big Thing In Health and Nutrition! Usually I like to take information that I find from many different sources, put it together and give you my opinion on it here on my blog. Well today I came across and article on Dr. Mercola’s health site, www.mercola.com, that was so good that I wanted to re-post it here on my blog in its entirety without commenting on it. I think Dr. Mercola said everything about as well as it could be said. This information is on vitamin K and it’s very well put together. The article is a bit long but well worth the read! Please enjoy! Vitamin K may very well be “the next vitamin D” as research continues to illuminate a growing number of benefits to your health. It is probably where vitamin D was ten years ago with respect to its appreciation as a vital nutrient that has far more benefits than was originally recognized. And, according to Dr. Cees Vermeer, one of the world’s top researchers in the field of vitamin K, nearly everyone is deficient in vitamin K – just like most are deficient in D.
Vitamin K measurements in blood plasma can be done accurately, but the results are not necessarily helpful because they mainly reflect what you ate yesterday. Because of this, we will have to trust Dr. Vermeer on his assessment that most are too deficient to reap all of its health benefits. Vitamin K researchers across the world will acknowledge him as a leader in this field. Vitamin K comes in two forms, and it is important to understand the differences between them before devising your nutritional plan of attack. Vitamin K1: Found in green vegetables, K1 goes directly to your liver and helps you maintain a healthy blood clotting system. (This is the kind of K that infants need to help prevent a serious bleeding disorder.) It is also vitamin K1 that keeps your own blood vessels from calcifying, and helps your bones retain calcium and develop the right crystalline structure. Vitamin K2: Bacteria produce this type of vitamin K. It is present in high quantities in your gut, but unfortunately is not absorbed from there and passes out in your stool. K2 goes straight to vessel walls, bones, and tissues other than your liver. It is present in fermented foods, particularly cheese and the Japanese food natto, which is by far the richest source of K2. Vitamin K2 can convert to K1 in your body, but there are some problems with this, which I will discuss shortly. As a supplement, K1 is less expensive, which is why it’s the form used for neonates. Making matters even more complex, there are several different forms of vitamin K2. MK4 is a synthetic product, very similar to vitamin K1, and your body is capable of converting K1 into MK4. However, MK4 has a very short half-life of about one hour, making it a poor candidate as a dietary supplement. After reaching your intestines, it remains mostly in your liver, where it is useful in synthesizing blood-clotting factors. MK7 is a newer agent with more practical applications because it stays in your body longer; its half-life is three days, meaning you have a much better chance of building up a consistent blood level, compared to MK4 or K1. MK7 is extracted from the Japanese fermented soy product called natto. You could actually get loads of MK7 from consuming natto as it is relatively inexpensive, and is available in most Asian food markets. Few people, however, tolerate it’s smell and slimy texture. Let’s take a look at what scientific studies are showing us about vitamin K2. In 2008, a German research group discovered that vitamin K2 provides substantial protection from prostate cancer, which is one of the leading causes of cancer among men in the United States. According to Dr. Vermeer, men taking the highest amounts of K2 have about 50 percent less prostate cancer. In 2004, the Rotterdam Study, which was the first study demonstrating the beneficial effect of vitamin K2, showed that people who consume 45 mcg of K2 daily live seven years longer than people getting 12 mcg per day. In a subsequent study called the Prospect Study, 16,000 people were followed for 10 years. Researchers found that each additional 10 mcg of K2 in the diet results in 9 percent fewer cardiac events. 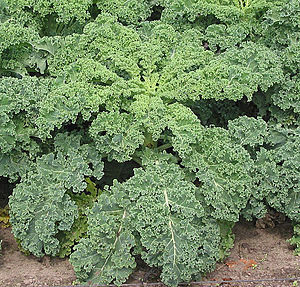 Preliminary findings also suggest that vitamin K can help protect you from brain disease. However, it is too early to say exactly what types of damage it prevents—and how—but it is an area of intense interest to vitamin K scientists right now. The evidence suggests that vitamin K2 is essential for your bone health, but it is a nutrient the vast majority of you do not get in adequate amounts from your diet. How does vitamin K lead to bone health? Osteocalcin is a protein produced by your osteoblasts (cells responsible for bone formation), and is utilized within the bone as an integral part of the bone-forming process. However, osteocalcin must be “carboxylated” before it can be effective. Vitamin K functions as a cofactor for the enzyme that catalyzes the carboxylation of osteocalcin. Vitamin K2 has been found to be a far more effective “activator” of osteocalcin than K1. A number of Japanese trials have shown that vitamin K2 completely reverses bone loss and in some cases even increases bone mass in people with osteoporosis. The pooled evidence of seven Japanese trials show that vitamin K2 supplementation produces a 60 percent reduction in vertebral fractures and an 80 percent reduction in hip and other non-vertebral fractures. Researchers in the Netherlands showed that vitamin K2 is three times more effective than vitamin K1 in raising osteocalcin, which controls the building of bone. Although your body can convert K1 into K2, studies show that the amount of K2 produced by this process alone is insufficient. Even if you are consuming enough K1, your body uses most of it to make clotting factors, leaving little remaining for your bones. In other words, your liver preferentially uses vitamin K1 to activate clotting factors, while most of your other tissues preferentially use K2. Vitamin K2 has also been found to offer you other benefits—besides your bones! As mentioned earlier, we are also learning that vitamin K2 has a major role in preventing cancer. The recent European Prospective Investigation into Cancer and Nutrition (EPIC) study, published in the October 2009 issue of the New England Journal of Clinical Nutrition, found high intake of vitamin K2—not K1—leads to reduced cancer risk, as well as a thirty percent lower risk of dying from cancer. A study funded by the National Cancer Institute found that vitamin K2 might help reduce the risk for non-Hodgkin lymphoma. Mayo Clinic researchers discovered that people with the highest intake of vitamin K2 had a 45 percent lower risk for this type of cancer, compared to those with the lowest vitamin K2 intake. Scientists attribute this to the important role that vitamin K2 plays in inhibiting inflammatory cytokines, which are related to this type of lymphoma, and vitamin K’s role the lifecycle of your cells. Are You Getting Enough Vitamin K from Your Diet? You can obtain all the K2 you’ll need (about 200 micrograms) by eating 15 grams of natto daily, which is half an ounce. However, natto is generally not pleasing to the Westerner’s palate, so the next best thing is a vitamin K2 supplement. But remember, you must always take your vitamin K supplement with fat since it is fat-soluble and won’t be absorbed without it. Although the exact dosing is yet to be determined, Dr. Vermeer recommends between 45 mcg and 185 mcg daily for adults. You must use caution on the higher doses if you take anticoagulants, but if you are generally healthy and not on these types of medications, I suggest 150 mcg daily. Fortunately, you don’t need to worry about overdosing on K2—people have been given a thousand-fold “overdose” over the course of three years, showing no adverse reactions (i.e., no increased clotting tendencies). It’s important to realize that vitamin K does not work alone. It needs collaborators—and vitamin D is an important one. These two agents work together to increase MGP, or Matrix GLA Protein, which is the protein that is responsible for protecting your blood vessels from calcification. In fact, MGP is so important that it can be used as a laboratory measure of your vascular and cardiac status. The results of human clinical studies suggest that concurrent use of vitamin K2 and vitamin D may substantially reduce bone loss. Increasing calcium is good for your bones but not so beneficial for your arteries, which can become calcified, but vitamin K protects your blood vessels from calcifying when in the presence of high calcium levels. So you really must pay attention to the synergism of all three of these nutrients if you want to optimize your benefits. I am convinced we are seeing just the tip of the iceberg when it comes to vitamin K and its many valuable functions in your health. It’s truly an exciting area in nutritional science today. In the meantime it is my STRONG encouragement to make sure you find some regular source of vitamin K2. This will mean eating about four ounces of fermented cheese a day (preferably raw) or taking a high quality vitamin K2 supplement. It is my strong belief that in ten years time there will be as much passion and appreciation for this stealth vitamin as we have for vitamin D today.